My son Nick is 12 so I have released my yard service from their duties so that he can experience the joy of mowing a lawn. I bought him a brand new electric push mower that is very light weight, but on a hill, it can get a little tough. I told him to attack that part of the yard first so that he could get it over with and didn’t have to deal with it at the end when he was tired. Later that day I was on the phone with my friend Bob O’Neill and he was talking about a few issues he was facing and how he believes you have to tackle problems head on! I think Bob has this right. When something bad comes up where we know someone isn’t going to be happy about it, or it’s going to be very uncomfortable to deal with, what do we do? Procrastinate so we don’t have to deal with it in the moment. Pass it off to someone else. Fix part of it so that it isn’t AS BAD. The reality is, things are going to come up that we don’t want to have to deal with so all we can do is manage our approach and how we handle it. Any of the aforementioned solutions just make things worse. We end up stressing out over it, and ultimately the problem grows. If you’re concerned about the people involved, they will get over it. If the downside of the problem is big, deal with it now or it will mushroom. If it is something that is causing you stress, the only way to solve for that is to tackle it because worry will grow not diminish. 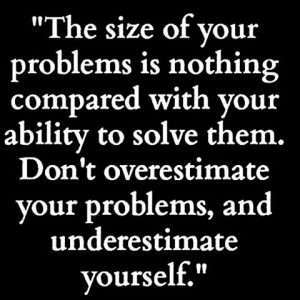 Grab your problem today, tackle it to the ground, and handle it like a boss. It’s usually not as bad as you think and then you’re free to deal with things that are more enjoyable. What I’m saying is simple, true, and forgotten by us all. This is your reminder. Mark, this spoke DIRECTLY to me. I had been stewing and stewing over a work issue that needed to be addressed with a difficult conversation. So yesterday I simply went in and did it. And you’re right….it’s never as bad as you think and it always makes you feel better. You’d think at my age I would know that. And I DO. But sometimes we all need a little reminder. So thanks for making my day much better! This is great to hear Peggy, thank you for sending me a note!